Dr. Matthew Oltmanns started his career as an optometrist, receiving his OD from the Pennsylvania School of Optometry in 2000. 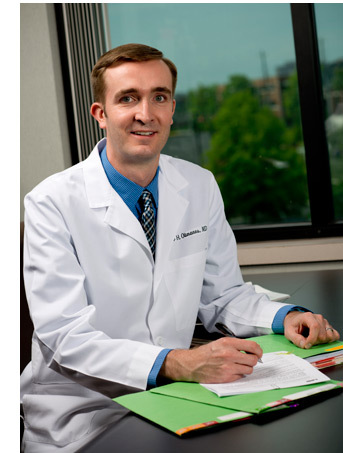 In 2002, Dr. Oltmanns set out to earn his MD and enrolled at Eastern Virginia Medical School. During that time, Dr. Oltmanns served as a staff optometrist at Gregory P. Jellenek, OD and Associates. In June 2010, he completed his residency in Ophthalmology at University of Florida, and was accepted into the two-year retina fellowship at UAB/Retina Specialists of Alabama Retina Fellowship Program under the tutelage of Dr. Robert Morris, Dr. Mathew Sapp, Dr. Doug Witherspoon and Dr. James Kimble. On July 1, 2012, Dr. Oltmanns became the newest member of the practice. In addition to his distinguished training in ophthalmology to sub-specialty training in vitreo-retinal surgery, Dr. Oltmann’s previous experience in practice gives him an easy, confident ability to care for patients.